This chapter reviews various concepts captured under the term Circular Economy, drawn together from various service innovation perspectives. The circular economy is built on the principle that all intermediary outputs that are of no further use in the firm’s value-creating activities are provided as inputs into other firm’s value-creating activities. The chapter identifies complexities around monetising value, monetising non-monetary benefits, different attributes that consumers and customers’ value in the services space, and the substitution effects that services can have on product sales. From insights and methodologies developed in the service design area, combined with the ability to measure and compare alternative attributes from a value performance point of view, it is identified that further research is needed to facilitate both a higher adoption and a greater success rate among services developed. 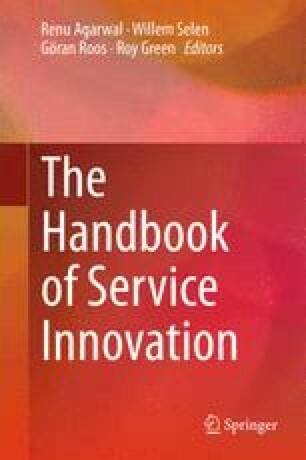 The chapter explores service innovation in the circular value chain as a growing domain of activity, and points towards a need for development of an appropriate business model framework within a circular economy for firms to engage in service innovation and delivery.